Okay folks, exciting new post today. I don’t write enough as I should about food, recipes, cooking and the like, mostly because I’m not that good at it. However, to compensate for my misgivings, I have an interview with Lindsay Nixon, who is a vegan chef and author, and has an upcoming cookbook coming out. I’m moved by the plight of farm animals, the environmental benefits, the humanitarian aspects and the health benefits. What are the biggest benefits of being vegan? Eating a plant-based diet is the most compassionate and responsible way to eat. There are also so many health advantages. For you, is there a moral dimension to being vegan, or is it practical? I don’t want any other human or animal to suffer, so I feel morally and ethically obligated to follow a plant-based diet to ensure I’m not contributing to others’ suffering. I am also an environmentalist, and know that eating a plant-based diet is the most sustainable and eco-friendly way I eat. Following a plant-based diet is also a practical approach for me. It’s an easy way for me to meet my health goals. What are the biggest misconceptions about being vegan? A lot of people thing beign vegan or following a plant-based diet is hard, or expensive and it isn’t. 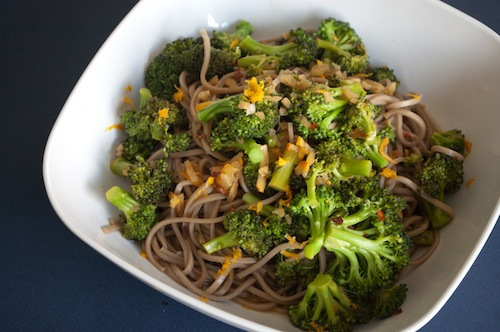 All you need is fruits, vegetables, grains and legumes — all of which are very inexpensive and easy to make. I wrote my cookbooks to show that eating this way is practical, and affordable and easy — and most importantly, really delicious. The only difficulty is the lack of convenience — you can’t just roll through a drive through anymore, but I, for one, am thankful for that. Eating a plant-based diet keeps me in line and ensures I make good food choices. Do you ever get cravings for meat? No, the smell of meat, particularly fish, chicken and beef actually disgusts me. I’ve never really had cravings for animal products after I gave them up. Are you vegan with only your food, or other products that you buy? I don’t identify as a vegan (see above); but my compassion does extend to other areas of my life. I avoid buying products that are tested on animals, or contain animal ingredients. I also try to avoid buying clothes, shoes, etc that have wool or leather. If a vegan or synthetic option is available, I go for it. Eating a plant-based diet is cheap! We cut our grocery bill in half! How does your typical day look like, in terms of the food you eat? Download one of Happy Herbivore’s meal plans and see! Do you mostly prepare your own food, or eat out? We rarely eat out. We spent the last year living on a small Caribbean island with no “eat out” options. Now we’re in a ski town in Colorado, and there are a few restaurants that will make something vegan for us if we ask them to hold the cheese — but I like my food better, anyway — and eating at home is cheaper and faster. Do you have any particular philosophy or rules you abide to when it comes to food? We eat a low fat, whole foods plant-based diet. It must be a whole food (no processed stuff! ), plant-based and absolutely no oil. We also don’t eat too many other added fats — like nuts, seeds, avocado. We follow the McDougall Program. How much do you typically spend on groceries? It really depends. When we lived in New York City, our grocery bill was very high because it’s New York City. Then in St. Maarten, the Caribbean island, it was even higher because all food had to be flown in, which made it outrageous. Here in Colorado, our grocery bill is more reasonable, especially since our market frequently has sales, such as 10 cans of beans for $10, or 10 bags of frozen veggies for $10 or all spices 2 for $2 ($1 each). We try to eat local, seasonal and staples that are on sale, which helps keep it under $100 a week (probably around $80) and that feeds 3 adults and 2 dogs (dogs eat real food not dog food) 3x a day. Plus that’s also covers additional groceries for recipe testing and recipe writing. My husband & I also snowboard everyday, so we probably eat double than most people… so really, it feeds 5 people. Do you ever feel the need to *splurge* on non-vegan food? No. If something looks good, and it’s not vegan, I can go home and make it. I just won’t compromise my health. Nothing tastes as good as being healthy feels… and I can’t compromise my morals. I can’t help or financially support cruelty. For you, what’s the key to eating and living healthy? Any good hacks for making the vegan life easier to abide by? I can’t speak for the vegan lifestyle, but if you want advice for eating a plant-based diet: just do it. Take it one meal at a time. Focus on all the glorious food you can have, not all the crap you gave up. Attitude is everything. Have a positive attitude you’ll have a positive experience. Any broader lifestyle philosophies that drive you? Simplicity? Religious? Etc? I consider myself a minimalist. I have two books, The Happy Herbivore and Everyday Happy Herbivore. How would you describe your new book in one sentence? Over 175 Quick-and-Easy (no fuss, “everyday” ingredients) low fat and fat-free recipes on the table in 30 minutes or less. What’s the biggest benefit you’re trying to convey to your readers? That eating healthy is affordable, realistic, approachable and delicious. What makes it unique from other books in the genre? Very few cookbooks, let alone vegan cookbooks, are fat-free and oil-free. My books also use normal “everyday” ingredients you can find at any grocery store (most vegan cookbooks use bizarre, expensive ingredients) and the recipes are really easy and fast and simple to make (vs. other vegan cookbooks have long, complex methods and recipes that take hours to prepare). I’m a home cook, not a chef, I get it. How is it different from your last book? Both books focus on wholesome “everyday” ingredients, low fat recipes… a no fuss cooking style, but Everyday has more variety. For example, I have smoothies in Everyday (something you won’t find in the first book). I also pulled in a lot of international inspiration. You’ll find recipes with Cajun flavors, Thai, African, Indian, Italian and so many more. What’s your reason for doing The Happy Herbivore? I started my blog (and now write cookbooks) with one mission: to show that eating healthy, plant-based meals is easy, approachable, affordable and most importantly — delicious. My recipes are all no fuss, everyday ingredients, quick and easy. I’m proving that healthy doesn’t have to be expensive or complicated or a shore. It’s possible — and fun! Are you working on anything else right now? Do you have a day job? I’m writing my third cookbook and managing happyherbivore.com, and all the projects associated with it. For example, we’re selling a 2012 calendar right now — which is a great project, the $1 proceeds from each sale support a student. We also have Meal Plans that come out every week and I just wrapped a wonderful a charitable necklace project — I sold over 400 necklaces. The proceeds are going to the elephant sanctuary. What are your long term goals for Happy Herbivore? Your writing career? I want to keep writing cookbooks for my fans and supporters; I take it all a day at a time. Are you doing it for business or pleasure? Happy Herbivore started as a hobby, a labor of love and turned in to a business. No one is more surprised than me… but it has always been about passion. I keep chasing my passion and doing what I love, which is helping others eat better. What do you feel is your most unique contribution to the vegan blogosphere? I don’t really identify as a vegan or a blogger — but Happy Herbivore is an amazing online community that I feel privileged to be part of. Every time I pop on to our facebook page I see how lucky I am to be a part of that. 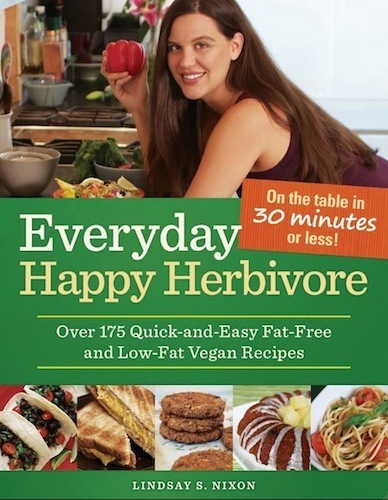 Get your copy of Everyday Happy Herbivore: Over 175 Quick-and-Easy Low Fat and Fat-Free Vegan Recipes. Buy on Amazon.